House Speaker Joe Aresimowicz and Majority Leader Matt Ritter talk with reporters. One day after the top Republican in the House criticized proposals to tax groceries and regionalize schools, Democratic leadership urged lawmakers to keep an open mind. “Everyone needs to take a deep breath,” House Speaker Joe Aresimowicz, D-Berlin, told reporters just before Wednesday’s House session. The 2019 legislative session, which is just three weeks old and features dozens of new lawmakers, likely will produce about 5,000 bill proposals, the speaker said. More importantly, he added, Gov. Ned Lamont has challenged lawmakers to help solve a pension and debt crisis predicted to bedevil state finances into the early 2030s. The speaker’s comments came one day after House Minority Leader Themis Klarides, R-Derby, expressed her disappointment with two Democratic bills to mandate greater consolidation of local school districts. “Does the grocery tax work? I could come up with reasons off the top of my head why I would have problems with it,” Aresimowicz said, adding that he would withhold judgment until the governor presents his full two-year budget proposal on Feb. 20. 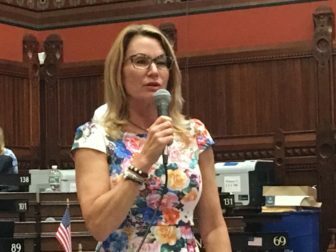 Klarides said Tuesday that taxing groceries is a “nonstarter” for her caucus. 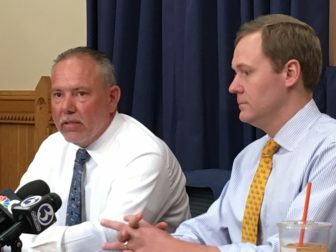 Both Aresimowicz and House Majority Leader Matt Ritter, D-Hartford, also said legislators should get used to making increasingly tough choices. Lawmakers imposed a number of difficult budget cuts between 2016 and 2018 in an effort to close deficits without major tax hikes. And with state pension and other debt costs continuing to rise, there are no easy budget choices left to make, they said. And school regionalization in some form may well be one of them, Democratic leaders said. Towns that participate in regional high school districts often still have their own elementary schools, Ritter said, adding he would ask legislative researchers to compile how much the state has spent in recent years building and renovating these schools, which typically serve a relatively small student population. “I bet it’s a shocking number,” he added.